Lavender is a scent with a long tradition in perfumes and Aromatherapy. The Romans used its antiseptic quality to bathe and cleanse their wounds. Lavender essential oil is known as the most popular and versatile essential oil. It is steam distilled from Lavandula angustifolia, a perennial, busy shrub with a flowery top. The many properties of lavender essential oil contribute to a vast range of usage. It is highly regarded as an antiseptic, anti-inflammatory, for skin care, or as a lovely fragrance. Usually common lavender (Lavendula angustifolia, Lavendula officinalis or Lavendula vera) is used in the production of the essential oil used in aromatherapy. Lavender was now being grown in fields containing neat rows of the flowers. Today the demand for the oil still grows and so does the distribution of lavender; being found today in China, Tasmania and England. 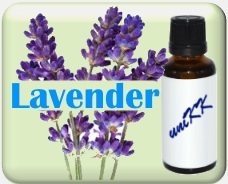 Unlike most essential oils lavender does not need to be diluted before using it, in some instances. A few drops on a pillow can aid the healing process, protect the skin from infection and improve sleep. Sniffing its light, floral aroma through a cotton wool pad helps calm frazzled nerves, decreases anxiety and calms the mind and body. Massaging with lavender oils or added it to a warm bath helps decrease muscle pains caused by tension, exercise or rheumatism. Menstrual pain can be also alleviated by gently massaging lavender over the lower abdomen, in a circular motion. Being so gentle, it is ideal to use on children and babies, to help prevent childhood infections and to soothe temper tantrums and upsets. Please note : consult qualified aromatherapist for correct use of essential oil. In ancient Greece, Pedanius Dioscorides, a physician, pharmacologist, and botanist, extolled the medicinal qualities of lavender. Greeks also used lavender as a perfume. The Egyptians used lavender as an ingredient in incense and perfume. I used lavender as a tea to treat her frequent migraines. Following a laboratory explosion that severely burned his arm, a French scientist named Rene Gattefosse was the first modern scientist to document lavender’s ability to promote tissue regeneration. We use lavender as a tea, to dress wounds, to induce sleep, ease depression, and reduce stress. Lavender oil is one of the safest essential oils and can be used in full strength on the skin. They also treated insomnia and other sleep disorders, by placing small dried bundles inside their pillows. The aroma was also believed to drive away bed bugs. Lavender oil is an essential oil, derived from plants by steam distillation of the flowers. Lavender is a native of the Mediterranean countries. The oil is widely used in aromatherapy to ease tension, tiredness and feelings of depression. Lavenders gentle yet powerful healing properties allow it to be used for burns and insect bites. Diffuse or inhale directly for aromatherapy. your pillow to aid in a restful night of sleep. oil on feet to promote relaxation.